Background: Immediate total-body CT (iTBCT) is often used for screening of potential severely injured patients. Patients requiring emergency bleeding control interventions benefit from fast and optimal trauma screening. The aim of this study was to assess whether an initial trauma assessment with iTBCT is associated with lower mortality in patients requiring emergency bleeding control interventions. Methods: In the REACT-2 trial, patients who sustained major trauma were randomized for iTBCT or for conventional imaging and selective CT scanning (standard workup; STWU) in five trauma centers. Patients who underwent emergency bleeding control interventions following their initial trauma assessment with iTBCT were compared for mortality and clinically relevant time intervals to patients that underwent the initial trauma assessment with the STWU. Results: In the REACT-2 trial, 1083 patients were enrolled of which 172 (15.9%) underwent emergency bleeding control interventions following their initial trauma assessment. Within these 172 patients, 85 (49.4%) underwent iTBCT as primary diagnostic modality during the initial trauma assessment. 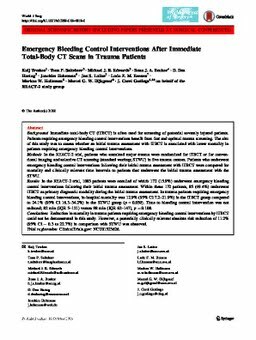 In trauma patients requiring emergency bleeding control interventions, in-hospital mortality was 12.9% (95% CI 7.2–21.9%) in the iTBCT group compared to 24.1% (95% CI 16.3–34.2%) in the STWU group (p = 0.059). Time to bleeding control intervention was not reduced; 82 min (IQR 5–121) versus 98 min (IQR 62–147), p = 0.108. Conclusions: Reduction in mortality in trauma patients requiring emergency bleeding control interventions by iTBCT could not be demonstrated in this study. However, a potentially clinically relevant absolute risk reduction of 11.2% (95% CI − 0.3 to 22.7%) in comparison with STWU was observed. Trial registration: ClinicalTrials.gov: NCT01523626.